Coconut is made from a brown fuzzy material with large purple and black button eyes and black stitching for his nostrils. His face, hands and feet are made from a tan coloured material and the inside of his ears and the tip of his tail are purple. Coconut the Monkey was introduced on 1st October 2009. 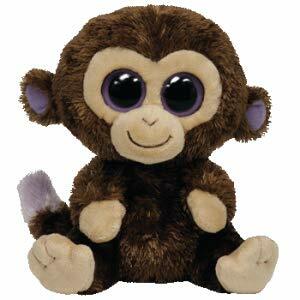 Coconut is one of the original seven Beanie Boos. The earlier version had tan coloured ears.